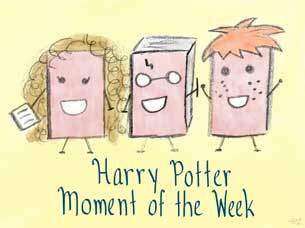 Rally the Readers: Harry Potter Moment of the Week (78): What Would Your Boggart Be? Harry Potter Moment of the Week (78): What Would Your Boggart Be? It must have been such a horrible experience for Hermione! I've been out of school a loooong time, but I still occasionally dream that I'm a student again and have forgotten to turn in homework or failed a test, lol. Mine would be a snake definitely. Can't stand them, never liked them, don't ever want to be near one. I'm not a fan of snakes, either! Even the little ones just freak me out! Ugh, spiders! No matter how big or small they are, they're just gross!